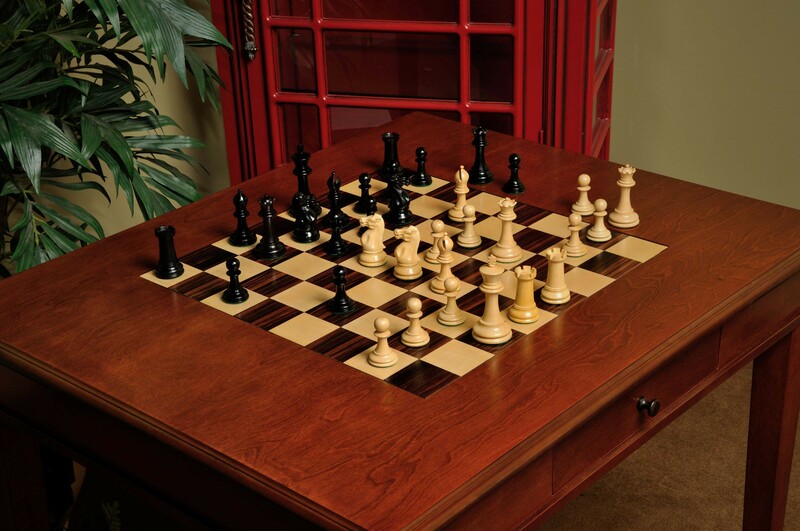 No other chess table currently on the market is designed to provide the space needed to actually play a serious game of chess! 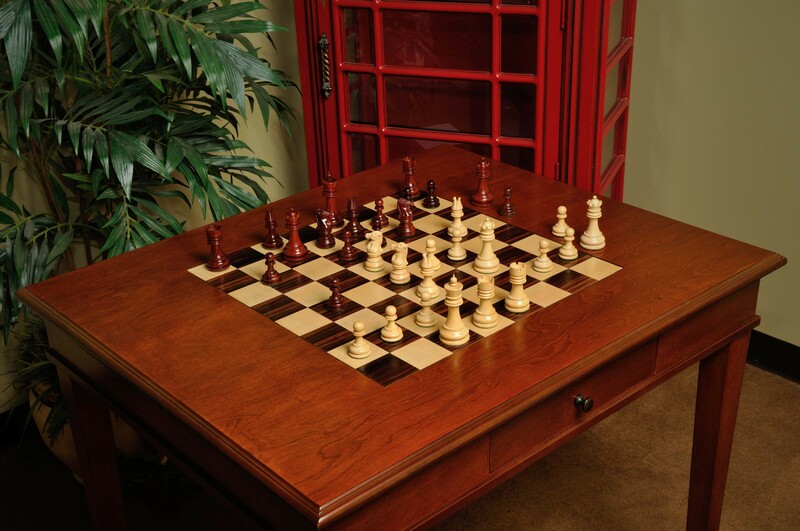 The table was designed to accommodate tournament-sized Staunton chessmen with King heights between 3.625" and 4.4". 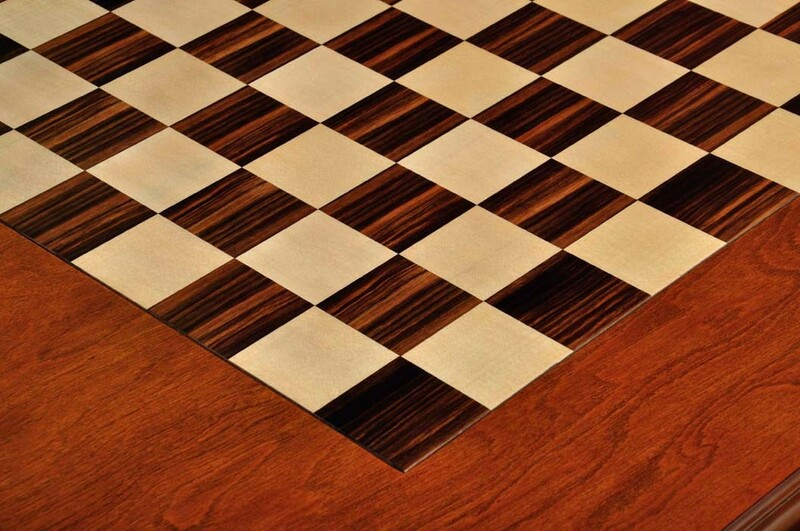 The square size of 2.375" inches was specifically chosen to allow it to work well with virtually all sets of chess pieces, from tournament-sized (3.75") to club-sized (4.4"). 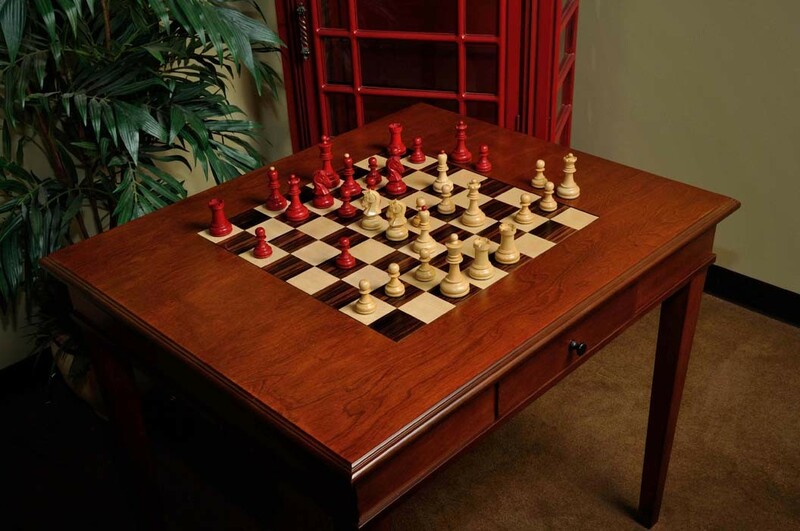 Specifications: The table is crafted from the finest Mahogany and stands 30" tall with a playing surface measuring 34" long with 28" between the players. The playing field is 19" square. 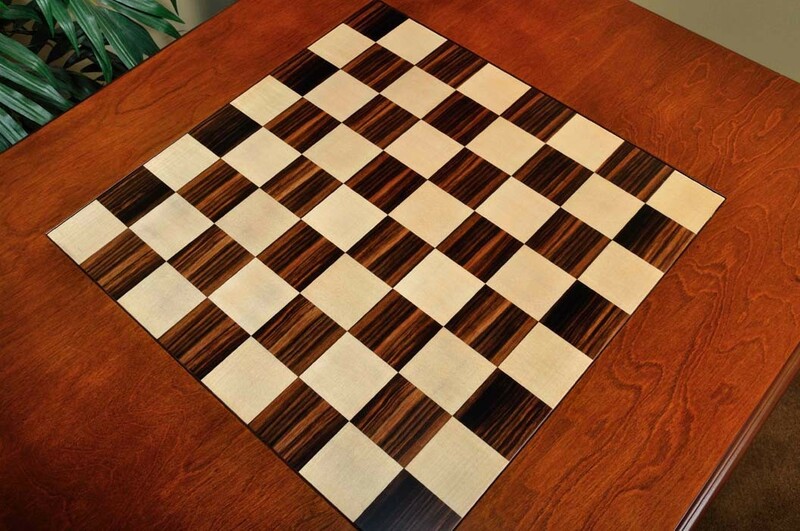 The top features 2-3/8" squares of Rosewood and Curly Maple. 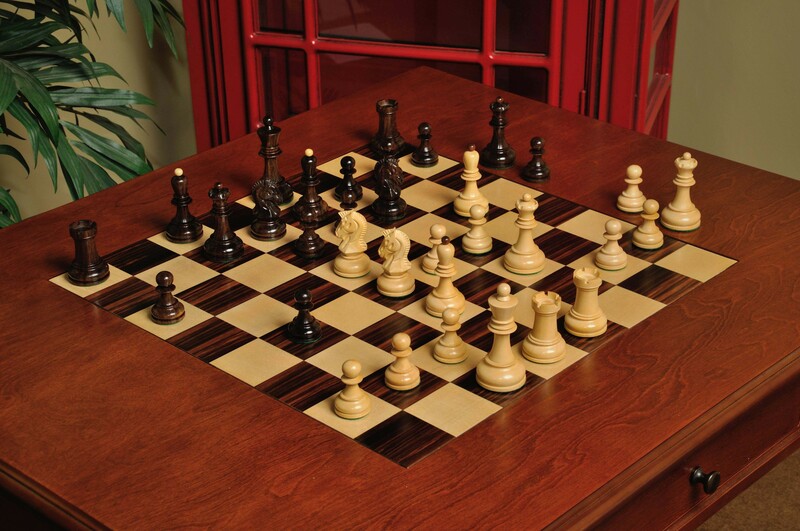 There is a single drawer, 15" long and 2" deep, for storage of the chessmen as well as other items. Logo: Both the House of Staunton and Camaratta Signature Logos are stamped inside the drawer, to denote this as a House of Staunton-product without detracting from its aesthetic beauty. The Table was securely packaged and arrived in immaculate condition. I thought that for this price I would have to convince myself that this table was the one for me, I couldn't have been more wrong. 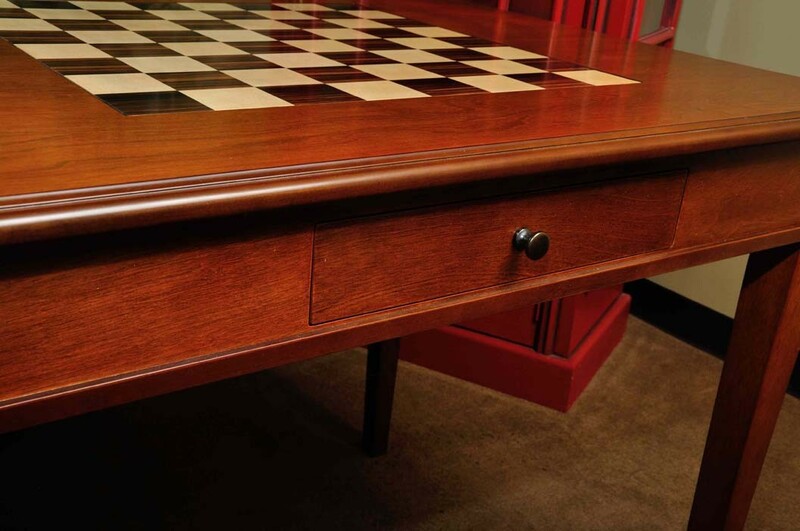 It has an elegant finish and the quality of the Camaratta table is evident in each detail. It's extremely sturdy and stable, has room for a clock, captured pieces, a scorebook, or perhaps a chess book you might be studying. 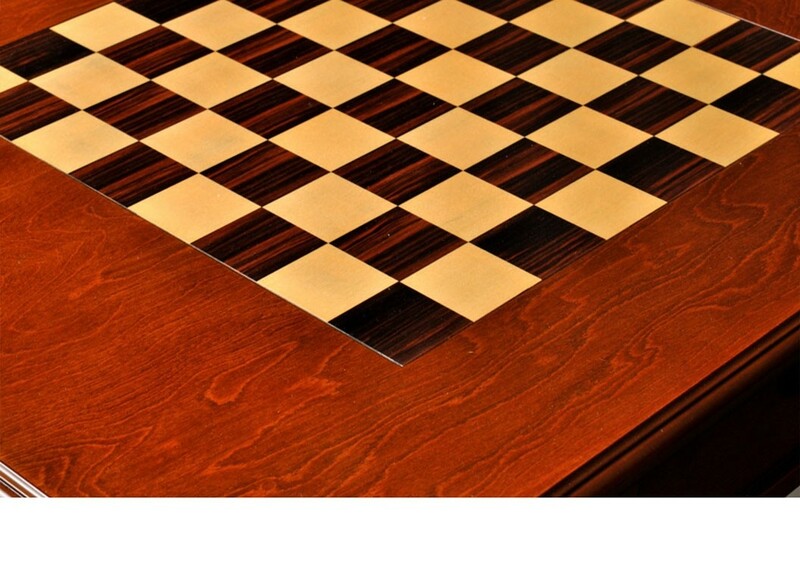 Look no further, this is the Chess table for your house! Just amazing at this price-range. Bought this on a whim, lucky me. The color is natural brown, not red which is a huge plus as far as I am concerned. The semi gloss finish is perfect and not annoyingly reflective. The drawer is felt lined and large enough for 4.4" king sets and clock. The build is remarkably classic and sturdy. This looks like a real piece of furniture that should cost hundreds of dollars more than I paid. The fit of the legs is very tight. I actually cut my legs to make it coffee table height and use it in my library. 1-There is a channel around the board that will have to be vacuumed for cleaning. 2-No notation. Some like it some do not. Perhaps offer the table either way. 3-Drawer only on the player side. 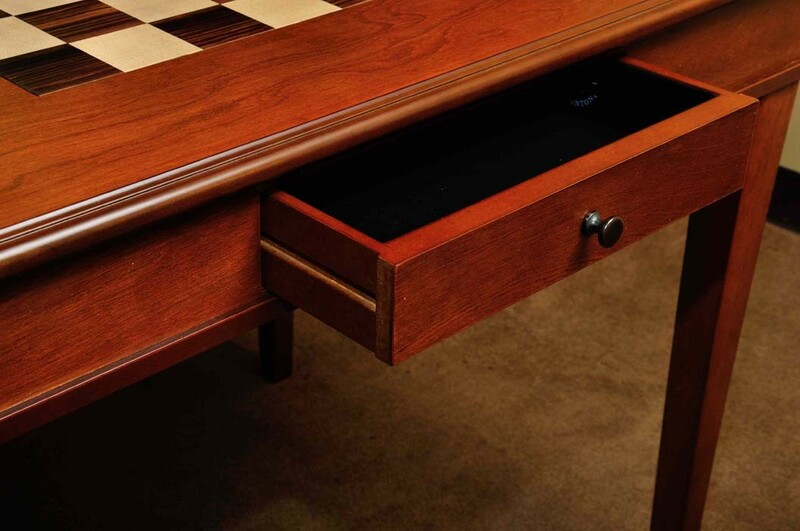 Would be nice to have the option of ordering the table with the drawer opening on a non player side. BTW, when I got the delivery and saw the table was manufactured in China, I was apprehensive and did not open it for a day. The packaging was superb. The table perfect in every way. And it is heavy, very heavy as it is solid mahogany--I cut the legs remember? 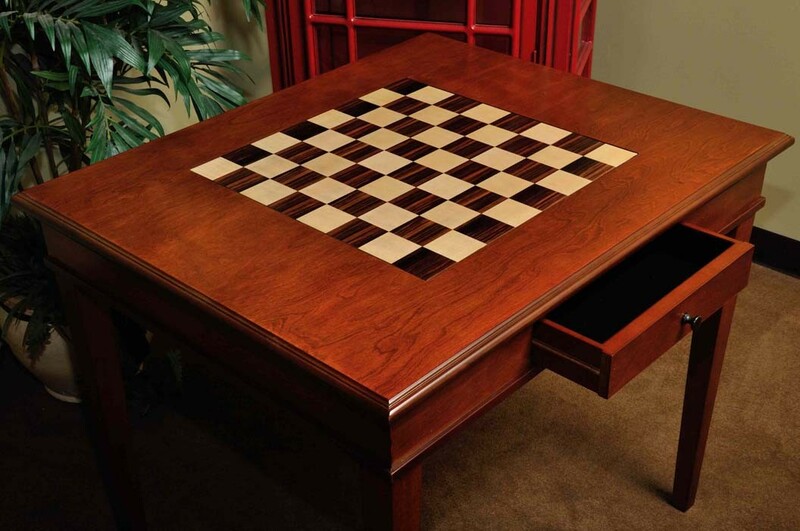 One would not be embarrassed to display this table in any setting. Glad I bought it. Limit of 1 Table Per Order.